I love Mimosa by Dear Stella. I just liked them on Facebook! I love getting updates from all of the online fabric places in my feed. I get some great deals that way! My favorite thing in the shop is Fairy Frost. LOVE it! enjoyed browsing the shabby! and found a bundle for my wish list ... Hoffman Batiks 9 FQ Set - Ocean/Sage by Hoffman Fabrics! i do follow shabby fabrics on fb! I love the new Lakehouse Penelope range. My favourite is the Rose. I already get the Shabby Fabrics newsletter. Thanks for the fantastic giveaway. Visited their website. :) Some of the fabrics in the Bella Butterfly line are super cute. Thank you for the giveaway! I've also liked their facebook page. Thanks you! My favourite is Lakehouse Penelope in Sky. Lakehouse Annie's Farmstand is great. Hadn't seen a lot of these fabrics before so glad you provided the link. I liked the Laura Ashley Prints. I'm loving the text prints of the Penelope collection oh and love Shabby Fabrics too! My favorite item is their Christmas Favorites BOM. I'm already signed up and can't wait for that one to start. I really like Renaissance and would buy that if I won. Thanks for the chance. I don't Tweet, BUT I commented on Facebook. Thanks for the chance to win. I like the blue lakehouse fat quarter set. So pretty. Love Shabby Fabrics. I am currently working on Merry, Merry Snowmen from them. I love the way they picture the fabric groups so you can see everything in the group. Love them. Thanks for the chance to win. I love your site and I usually go to your kit section it takes the guess work out of picking fabrics. Love all their fabrics - but the Love Letters collection is my favorite. I love Shabby Fabrics choice in fabrics!! Roses and romantic, soft florals....awww..just my cup of tea. I have been drooling over the English Garden linens, would love to have some. Thank you for a chance at winning. Shabby Fabrics carries lovely fabrics, from old-fashioned floral prints to seasonal fabrics and I love them all. Right now, my favorite is a novel fabric, though - it's the English Garden Matelasse by Rachel Ashwell for Treasures. I just LOVE Princess Rose in all of the color ways! I like the Siena collection; the colors are gorgeous. Thanks for the chance at your giveaway. I signed up for their email...is that also the newsletter or have I missed it? Thanks for the second opportunity to win! I like the Lakehouse Penelope collection, especially the blues and yellows. I like all the unique quilt kits they carry, and the candlemats are especially adorable. Shabby Fabrics has such wonderful BOM's!! I love them all. Who can pick A favorite? there are too many! Today Athill Range collection caught my eye for a quilt for my Mama. Thanks for a great opportunity! Most generous! I already get the newsletter! Thank you! I love the Lakehouse Penelope Rose! It's hard to pick just one thing as a favorite - their store is wonderful! I'm enjoying their Christmas Ornament BOM which began last month, but I also like a lot of their applique quilt patterns. Now I get the newsletter! Thanks! I am following Shabby Fabrics on Twitter now. I love the Princess Rose collections, esp. the plaids. I love the "Sentiments" charm pack by Three Sisters, Moda. Yummy. I receive the SF newsletter, and read the blog, too! I like the Bella Solids. I love the Bella Solids! Thanks for a great giveaway! I really like the lecein rose fabrics, all of them and all of the colors, sooooo pretty. I love Shabby Fabrics. I like the Blessings of Autumn BOM. I love all of the MODA. I still want some of that Flower Sugar! I love the free monthly cottages and have printed out wach one to do in the future. So many fabrics that I love Pricess rose, Antique flowers and sunday best would be at the top of the list though :) !!!!! My favorite thing is the Mischief line of fabric by Nancy Halvorsen! I'm now receiving the newsletter. Wow! I could spend all day looking at their site. I'm liking the romantic look of the fabrics and projects they carry. I really like all the traditional-looking patterns of small, swirly flowers. It's not just one thing - I like the variety! The children's section is great, the pre-cut section is great, the fabric selection is great. How can I pick just one? One of my favorites in this shop is the Blessings of Autumn block of the month. Love the whole shop though. i like the gerry giraffe pattern. I like the Bakers Dozen quilt pattern. I love Shabby Fabrics! I would love to have one of their quilt kits. I am already friends with Shabby Fabrics on Facebook. I receive the Shabby Fabrics newsletter and love it! I receive Shabby Fabrics Newsletter! LIKE+SHARED ON SHABBY FABRICS FB PAGE! 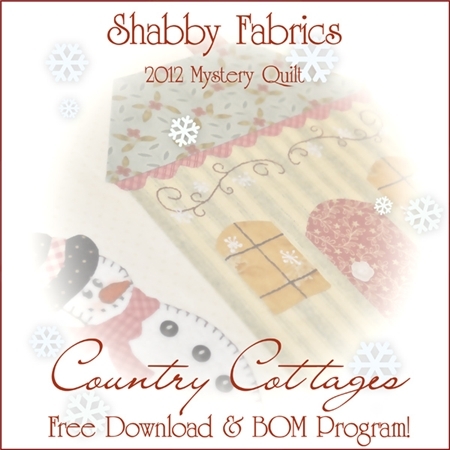 VISITED SHABBY FABRICS>LOVE PRAIRIE PAISLEY! I love the Lakehouse by Penelope -- any colorway is beautiful!! Actually, I love most everything! I love all their patterns - but I think my favorite (at the moment) is Raspberry Lemonade. The border is a little daunting, but I just can't get enough of the whole look of the quilt! I was looking through the birds and butterflies section, there are a lot in there I like. For today I am going to say garden of enchantment, but I also like bella butterfly and more! I Love, Love, LOVE their "words" section. In particular, I have a passion for "Lakehouse 9013 Champagne Panel by Holly Holderman for Lakehouse Dry Goods Fabric". So pretty. I love the Sentiments collection by three sisters. I love Blueberry Crumb Cake! I like the Antique Fair collection. I really like the Curiosities 30 FQ set! Pretty stuff. I like the Layers of My Heart Candlemat Kit, I've been thinking about making a candle mat for awhile now, thank you for the giveaway! I follow Shabby Fabrics on Facebook too, thank you again! I like their Shabby Fabrics Applique Kit. It has everything you need for applique. I am signed up for Shabby Fabrics' newsletter. I follow.Shabby Fabrics on Twitter. Hi! I just signed up for the Shabby Fabrics Newsletter! I love the Ambrosia 10 FQ Set by Jinny Beyer for RJR Fabrics. Beautiful colors!!!! I am now now subscribed to 'Shabby Fabrics Email List'. Thanks! Just visited Shabby Fabrics. I love the Sentiments line of fabric! Pumpkin ville quilt by Bunny Hill! Love that!! I am in love with the Bridgeport fabrics at Shabby Fabrics. I am now following Shabby Fabrics on Twitter. I love the Baker's Dozen pattern! It was just to hard to choose a favorite. Love all the fabrics. I love the Girl in Paris kit by Fig Tree! it was a hard choice since there are so many beautiful items on the website but I did like the kit "As For Me and My House"
I follow Shabby Fabrics on Twitter too! I already receive Shabby Fabrics newsletter. I follow Shabby Fabrics on FB and left a comment. I love the Antique Flower 8 FQ Set - Breeze by Lecien. I love Shabby Fabrics and I'm sibscribed to her newsletter. I would love to win. I definately want Peneplope fabric the Paris print in yellow, two yards for pillow cases. Thank you for the chance to win. I loved the merry, merry snowmen kit! Darling! My favorite is the 'Tis the Season fabric collection by Rosemarie Lavin for Windham. Blue is my favorite color and it's blueberry season. My selection is Blueberry Crumb Cake by Blackbird Designs for Moda Fabric at Shabby Fabrics. Shabby Fabrics is my first stop when I'm looking for fabric. I subscribed to their newsletter. I receive their newsletter. Like the free cottage house pattern. The Night Set of Lakehouse Penelope is my favorite! I love Shabby Fabrics - my favorite is Lakehouse Penelope 20 FQ Set - Sky by Holly Holderman for Lakehouse Dry Goods. I love the Tonga Batiks! I am signed up for the Shabby Fabrics newsletter. The Penelope FQ set in the black colorway really caught my eye! They are all so pretty! I "Like" Shabby Fabrics on Facebook! My favorite item on the Shabby Fabric website is Sentiments Layer Cake by 3 Sisters for Moda. Beautiful. I like Shabby Fabrics on FB! Thanks for the chance to win!! The Barefoot Roses collection and Ambrosia by Jinny Beyer are my favorite fabrics. So much good stuff at Shabby Fabrics! Barefoot Roses is really pretty. I really liked the six house blocks. I like the Penelope collection by Lakehouse. I follow them on Twitter. Thanks for the chance to win! Love Gerry the Giraffe!! I love the red handwritting fabric too - lovely stuff!! Great giveaway!